when the Mediterranean was the crossroads of the world and pirates were the scourge of Europe and the glory of Islam. They attacked ships, enslaved crews, plundered cargoes, enraged governments, and swayed empires, wreaking havoc from Gibraltar to the Holy Land and beyond. Historian and author Adrian Tinniswood brings alive this dynamic chapter in history, where clashes between pirates of the East (Tunis, Algiers, and Tripoli) and governments of the West (England, France, Spain, and Venice) grew increasingly intense and dangerous. In vivid detail, Tinniswood recounts the brutal struggles, glorious triumphs, and enduring personalities of the pirates of the Barbary Coast, and how their maneuverings between the Muslim empires and Christian Europe shed light on the religious and moral battles that still rage today. 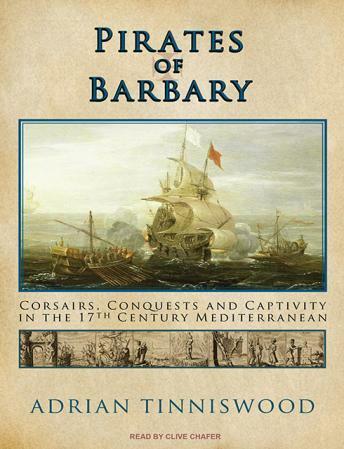 As Tinniswood notes in Pirates of Barbary, 'Pirates are history.' In this fascinating and entertaining book, he reveals that the history of piracy is also the history that shaped our modern world.